This is a party everyone will want to attend! Mimosas: a socially acceptable way to start drinking at breakfast. Just kidding. Kind of. 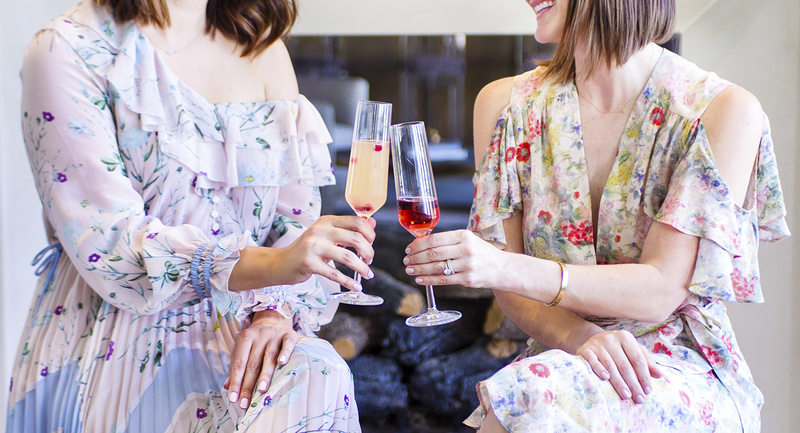 But really – who among us doesn’t love a refreshing mimosa at a delicious brunch among friends? We’re going to guess the majority of you are with us on our love for this most perfect beverage. Truly, what’s not to love? Fresh juice and bubbly champagne? It’s the most wonderful combination. Plus, the juice practically makes it healthy, right? Well, in honor of National Mimosa Day (which is today!) 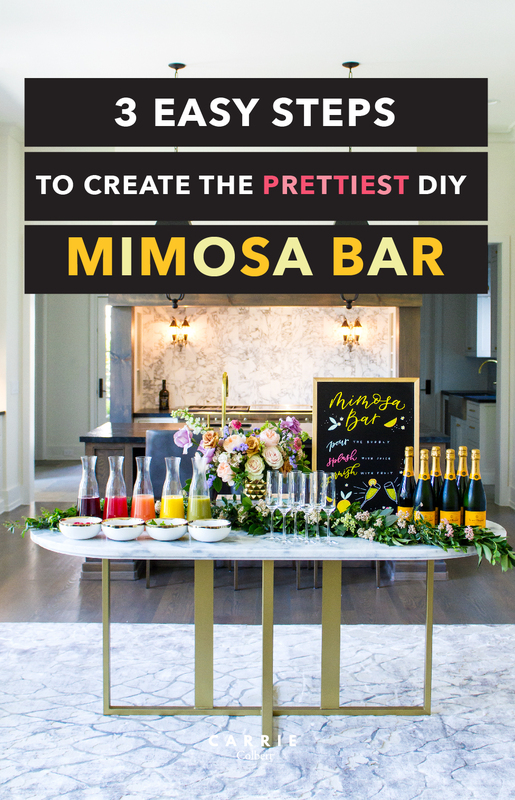 – a holiday which we can fully support – we’ve pulled together the prettiest, most elegant, and easy DIY mimosa bar that you can make in the comfort of your own home! Or in this case, in this incredible home built by Jennifer Hamelet of Mirador Builders, staged impeccably by High Fashion Home. 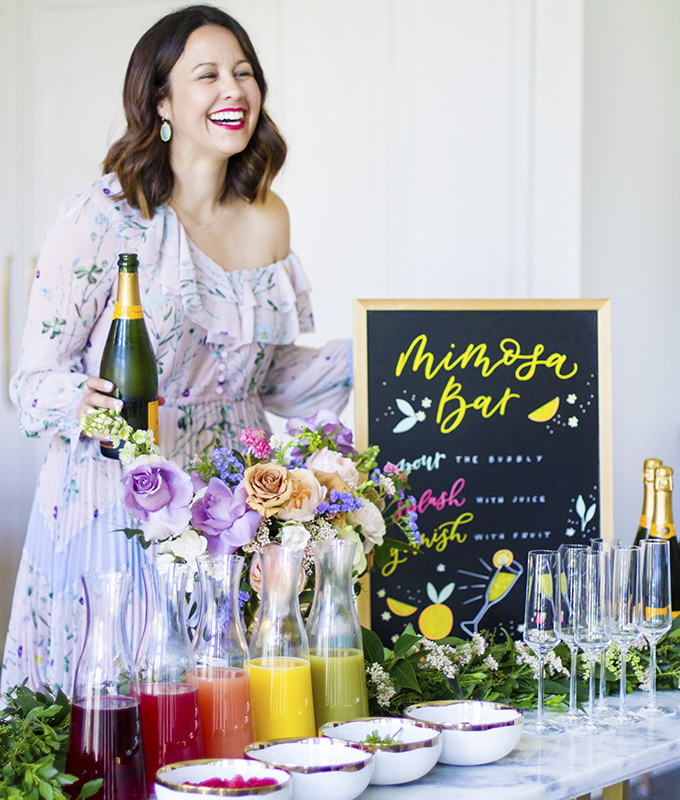 Also, if you are an Anglophile, this mimosa bar might just be the perfect idea for your Royal Wedding watch party this weekend. And let’s be honest – mimosa season is really all year round, especially those summer months. 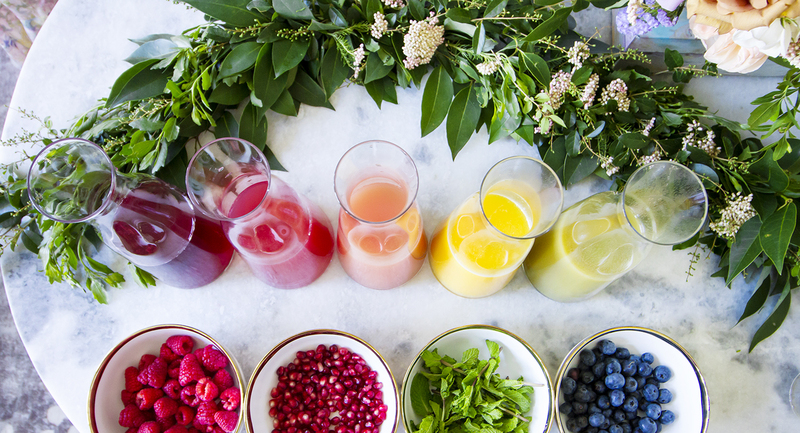 Keep on reading for the three steps to the easiest at-home DIY mimosa bar! 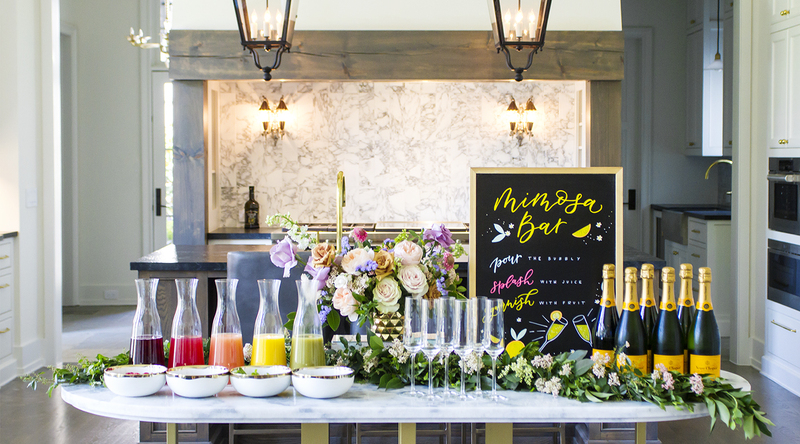 A traditional mimosa consists of orange juice, but of course don’t just leave your mimosa bar at that. That’d be a basic mimosa, and you know we aren’t basic around here! 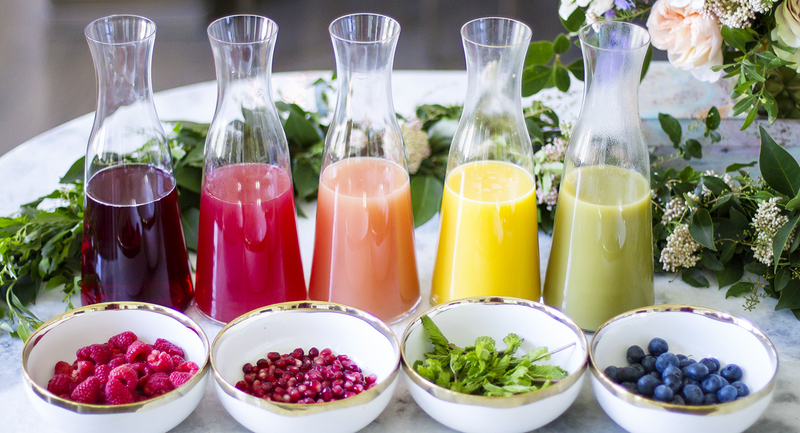 Consider offering a rainbow of fruit juices. We ourselves offered not only orange juice, but also grapefruit, blood orange, cranberry, and honeydew. We might have chosen these based on their colors (are you surprised? ), but they’re also deliciously refreshing and pair perfectly with champagne. 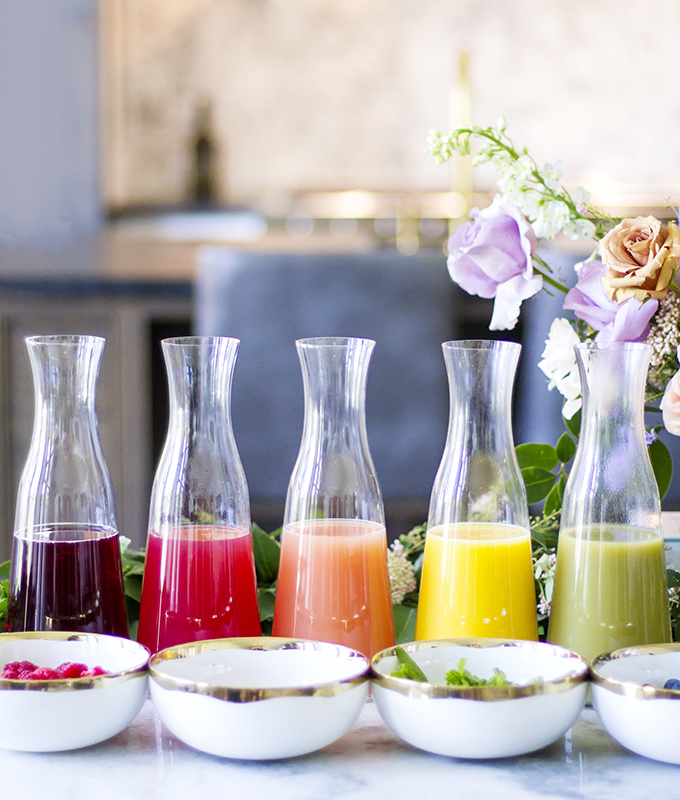 Pour each juice in its own individual carafe, and line them up in rainbow order on your “bar.” Now, your bar doesn’t have to be an actual bar. Simply set them up on your counter, table, or any other place that offers up enough space. 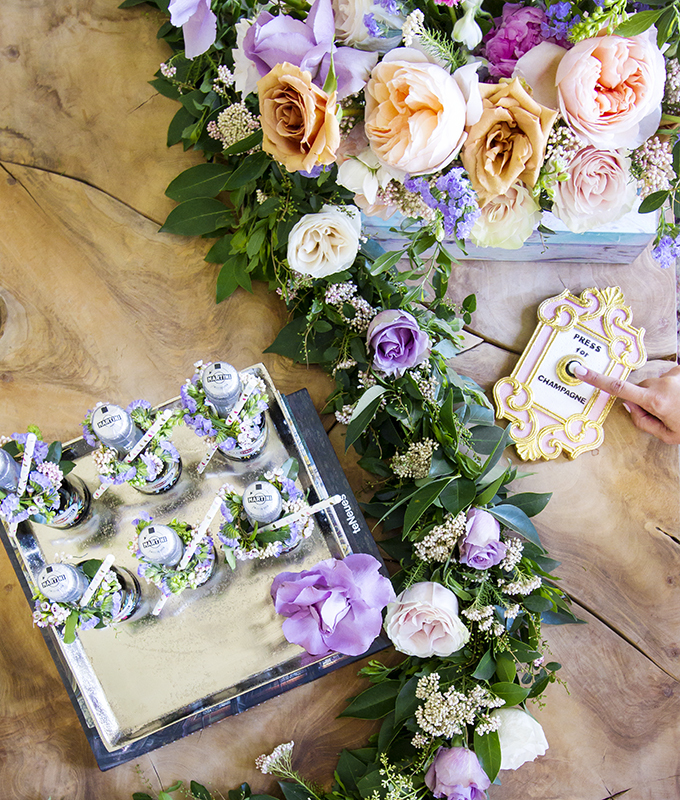 As with all our events, florals are a big component. 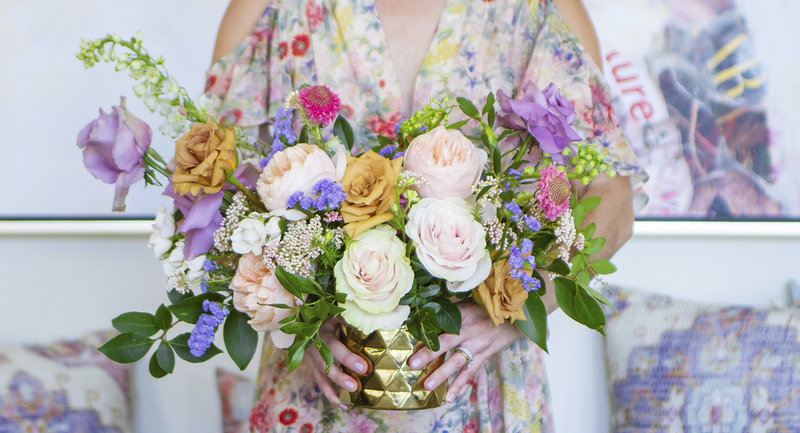 Beautiful florals truly pull everything together. 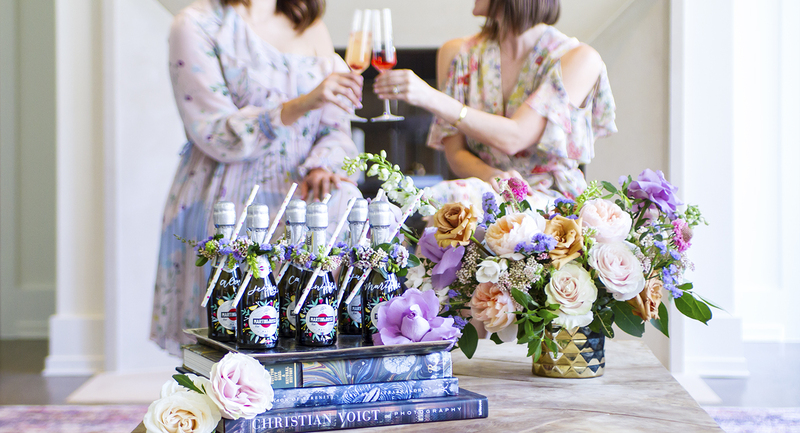 We worked with Mibellarosa on a beautiful arrangement that was the centerpiece of our mimosa bar. We went with a saturated pastel color theme to go along with the juice colors and the spring season. 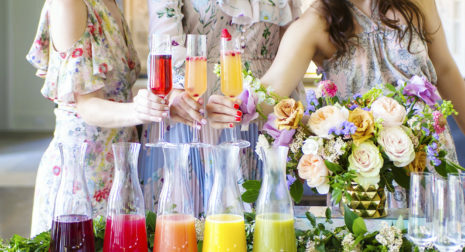 We then added in some bowls of fresh fruit (and mint) to add even more color to the table and taste to the drinks, as we used them as garnishes. Now, if you’re hosting a party, don’t ever forget party favors! You always want to send your guests home with a little something special. 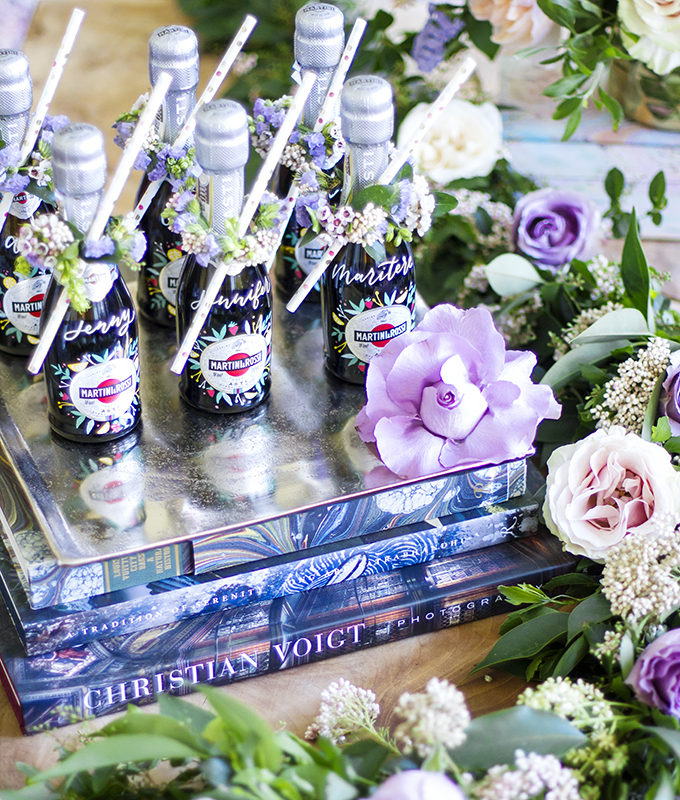 And I think we certainly achieved that with these mini champagne bottles with flower crowns. Adorable, right? Each bottle was personalized with our guests’ names on them, courtesy of the super talented Kristara. And don’t forget the signage! While a party invitation sets the tone for a party, themed signage continues to sing the melody of your party. Signage need not be complicated, but we can’t resist making things colorfully beautiful. So, we again enlisted Kristara to craft a mimosa bar sign. 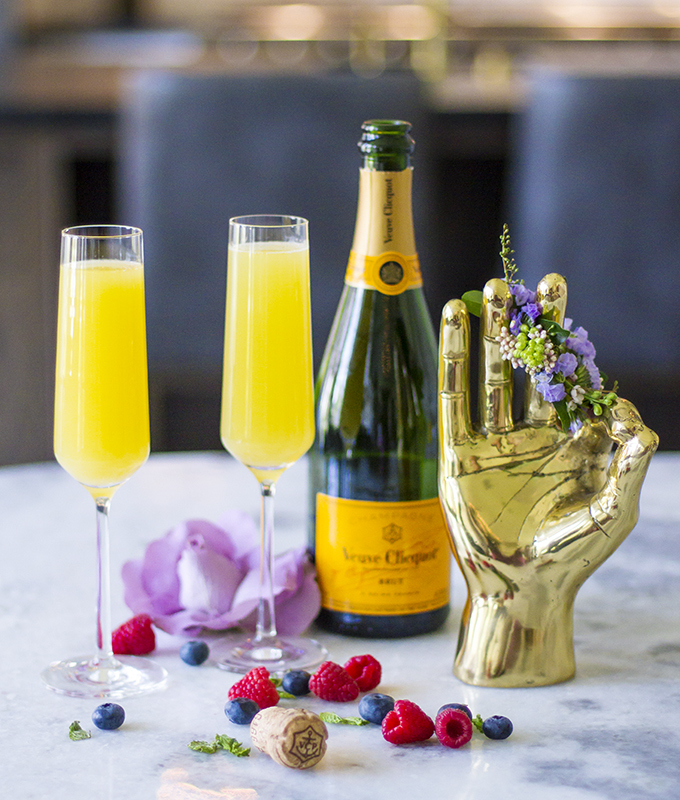 It simply states how to create your mimosa, while adding such a fun touch to the table. 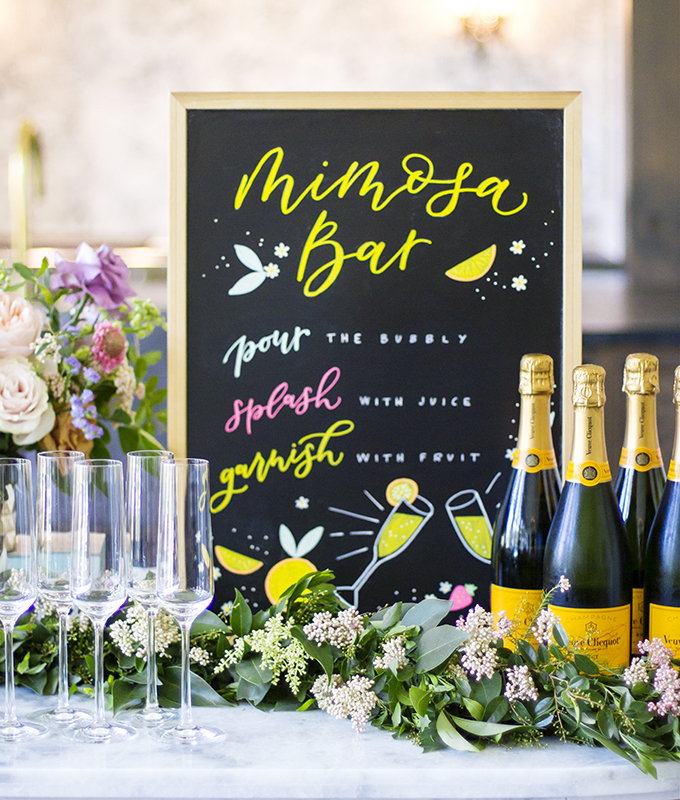 Speaking of signage, if you’re planning to give this mimosa bar idea a try for your Royal Wedding watch party, may we suggest some particularly clever signage? And while you don’t have to dress the part, it’s so much more fun when you and your guests do, right? 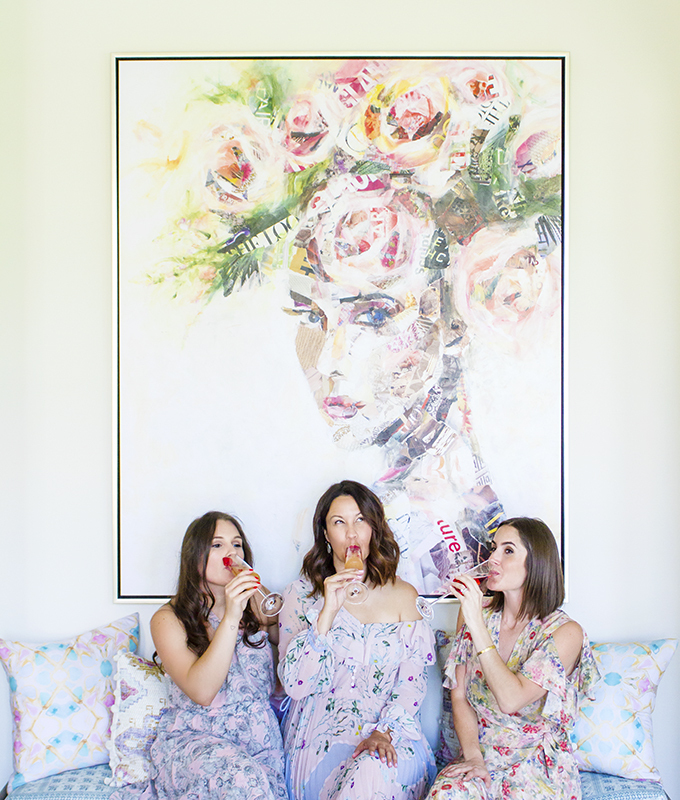 We decided on pastel floral frocks, all from Tootsies, to go along with the season and the pastel floral theme. 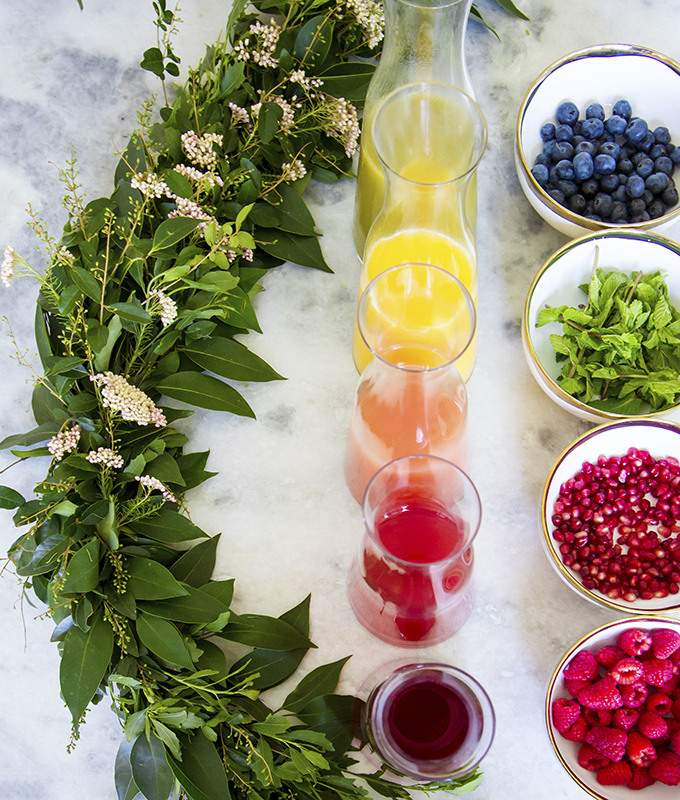 We hope you enjoyed this DIY mimosa bar that you can easily throw together at home. It was so much fun creating it! 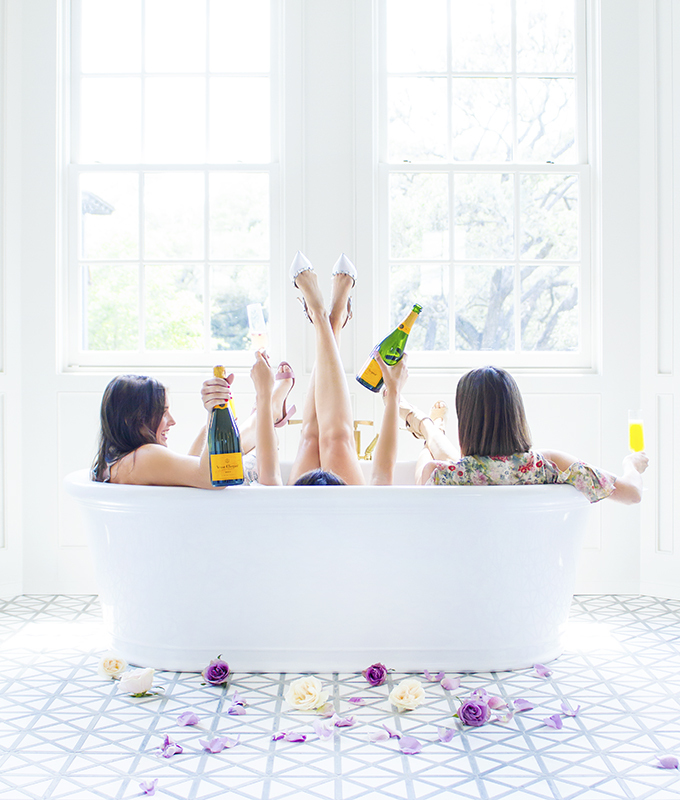 Now, grab your champagne flutes and go out and celebrate. Or rather, stay home and celebrate. And a huge thank you goes out to our creative partners, Kristara and Mibellarosa. We’re always thrilled to work with such talented women. 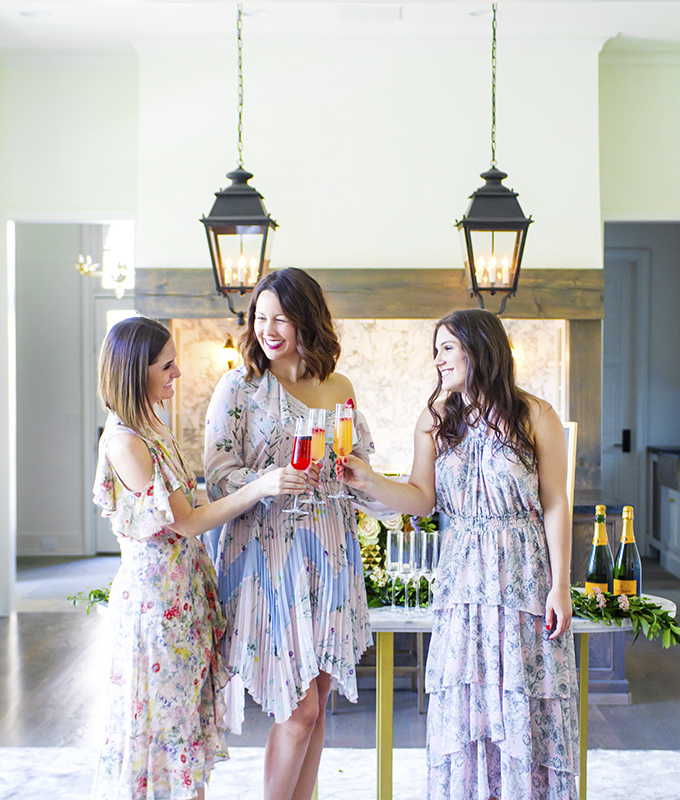 And of course, thank you again Jennifer for inviting us to set up our mimosa bar in your gorgeous home! Enjoy your day and we’ll see you back here tomorrow! Oh what a lovely idea! Send us pics when you do it. Your friends will love it! 21 tips on why you need one, how to shop for one, and how to style one.